I was born in Newark, New Jersey, where my parents were sent by the Previous Rebbe as his emissaries. Their mission was their whole life, and I was raised in an atmosphere of service and of connection to the Rebbe. Growing up, I was keenly aware how much the Rebbe – his blessings, his advice, his influence – permeated our lives. On another occasion, the Rebbe gave my father a blessing that had the most amazing results. This was at a time when our Newark neighborhood was changing and the Jewish people were moving out to the suburbs. As the rabbi of the local synagogue, my father had to follow, and he moved our family to Maplewood, New Jersey. But he was unable to sell our Newark home and was stuck with two mortgages. This distressed him very much, and he asked the Rebbe for a blessing to get out of the situation quickly. “The Rebbe said you should do it,” my father insisted, and hearing that, Mr. Dansker agreed to put an ad in the newspaper on his behalf – this was the only thing he knew to do. The ad appeared, but it came out garbled – something must have gone wrong in the typesetting. My father called Mr. Dansker and told him, “You should get your money back because they messed up the ad.” But Mr. Dansker responded, “They messed up the ad, but you have a fellow coming to see your house in the next half hour.” And that fellow bought the house! I, myself, saw the Rebbe many times and received many blessings and much advice from him. Here I would like to relate just a few of those encounters which proved especially impactful on my life. When I was fifteen years old, I wrote to the Rebbe reporting that I was participating in his tefillin campaign – that every day I would go to an old age home to help about half a dozen men put on tefillin. In response, the Rebbe gave me a blessing to be successful in this endeavor. I feel that this blessing has followed me throughout the years because I have had a very high success rate in this mitzvah. Later, when I turned nineteen, I was sent by the Rebbe to the newly opened yeshivah in Miami. And during a private audience, I got an unforgettable piece of advice from the Rebbe. He told me, “The success of your mission depends upon you being a living example to others.” This is something I have quoted over and over, because it taught me how to be the best emissary I could possibly be. After receiving my rabbinic ordination, I taught at the Yeshiva Tiferes Bachurim in Morristown, New Jersey, and then, in 1978, I got engaged. But my fiancée wanted us to live in New York after the wedding, while I was reluctant because I was worried about making a living if I gave up my Morristown job. So, I wrote a letter to the Rebbe asking what to do. I have treasured his answer ever since then. I have shared it with many people, and I had it printed to give out at my son’s wedding. His answer not just answered this particular question, but every single question I’ve had since then – it was a blueprint for dealing with every dilemma in life. Because of this answer, my father became the first person I always went to for advice and, when he couldn’t help me, he’d direct me to others who could. Another time, in a private audience, I asked the Rebbe how I might correct something that I had done that was not up to standard. The Rebbe told me (and I am paraphrasing his words): “As an emissary, when you fulfill your mission well, you fix any blemish that you may have, including the issue that you wrote about.” From this I understood that, for me, there’s one solution for every mistake, which is dedicating my life to fulfilling my mission properly. More than anything else, this advice sustained me when, in 1984, I went to Tasmania, Australia, to be the Rebbe’s emissary there. I knew that whenever I messed up – because I was a human being and fallible – there was this solution, as the Rebbe taught me. When we first shipped off to Australia, the Rebbe gave my wife forty Australian dollars earmarked as a contribution toward us getting settled in Australia. And, ever since then, I have felt that, with this money, the Rebbe made an investment in our mission. To this day, when I invite people for Shabbos meals or for classes which I give in our house, I feel like the Rebbe is my partner in every endeavor. And I know that I will succeed because he is there with me. 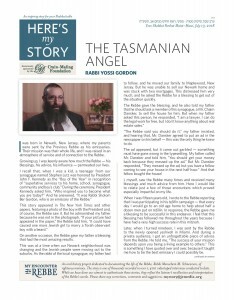 For nearly thirty-five years, Rabbi Yossi Gordon and his wife, Mina, have served as the Chabad emissaries in Tasmania, Australia. He was interviewed in July, 2016.